↑ The New Oxford Dictionary of English (1998) ISBN 0-19-861263-X – p.540 "Diwali /dɪwɑːli/ (also Divali) noun a Hindu festival with lights...". ↑ Vera, Zak (February 2010). Invisible River: Sir Richard's Last Mission. आई॰ऍस॰बी॰ऍन॰ 978-1-4389-0020-9. अभिगमन तिथि 26 October 2011. First Diwali day called Dhanteras or wealth worship. 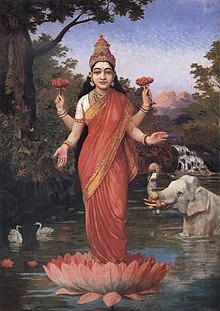 We perform Laskshmi-Puja in evening when clay diyas lighted to drive away shadows of evil spirits. ↑ Sharma, S.P. ; Gupta, Seema (2006). Fairs and Festivals of India. Pustak Mahal. पृ॰ 79. आई॰ऍस॰बी॰ऍन॰ 978-81-223-0951-5. ↑ Upadhye, A. N. (Jan–Mar 1982). Cohen, Richard J., संपा॰. "Mahavira and His Teachings". Journal of the American Oriental Society. American Oriental Society. 102 (1): 231–232. JSTOR 601199. डीओआइ:10.2307/601199. ↑ "Ramcharitmanas, Uttarkand". अभिगमन तिथि 1 मार्च 2019. ↑ "Indian Government Holiday Calendar". National Portal of India. अभिगमन तिथि 15 March 2010. ↑ अ आ इ Pintchman, Tracy. Guests at God's Wedding: Celebrating Kartik among the Women of Benares, pp. 59–65. State University of New York Press, 2005. ISBN 0-7914-6596-9. ↑ Lochtefeld, James G. "Kartik" in The Illustrated Encyclopedia of Hinduism, Vol. 1: A–M, p. 355. Rosen Publishing. ISBN 978-0-8239-3179-8. ↑ Max Müller (Translator), The Upanishads, Katha Upanishad at Google Books, Quote: "The wise prefers the good to the pleasant, but the fool chooses the pleasant through greed and avarice. Wide apart are these two, ignorance and wisdom. [...] What is called a treasure is transient, for the eternal is not obtained by things which are not eternal. The wise who, by means of meditation on his Self, recognizes the Ancient, he indeed leaves (transient) joy and sorrow far behind. [...] Beyond the senses there are the objects, beyond the objects there is the mind, beyond the mind there is the intellect, the Self is beyond the intellect. Beyond the Self is the Undeveloped, beyond the Undeveloped is the Purusha. Beyond the Purusha there is nothing, this is the goal, the highest road. A wise man should keep down speech and (impulses of) mind, he should keep them within the Self which is knowledge." ↑ Pechilis, Karen (2007). "Guests at God's Wedding: Celebrating Kartik among the Women of Benares". The Journal of Asian Studies. 66 (1): 273–5. डीओआइ:10.1017/S0021911807000460. ↑ Holm, Jean (2006). "Growing Up in Hinduism". British Journal of Religious Education. 6 (3): 116–20. डीओआइ:10.1080/0141620840060303. ↑ "US House passes resolution on significance of Diwali". द हिन्दूstan Times. 30 October 2007. ↑ "Statement by the President on Diwali". 4 November 2010. ↑ "News". www.sanantonio.gov. अभिगमन तिथि 1 मार्च 2019. ↑ Vora, Shivani (20 October 2011). "New York's Pierre Hotel Celebrates its First Diwali". दि न्यू यॉर्क टाइम्स India blog. अभिगमन तिथि 2011-10-20. ↑ "New Jersey Hindus pained as no School Holiday for Diwali in 2014". news.biharprabha.com. अभिगमन तिथि 10 February 2014. ↑ अ आ Roy, Amit (25 October 2011). "Dazzle at downing, colour at commons". Mumbai Miday. अभिगमन तिथि 3 November 2013. ↑ "Transcript of the Prime Minister's Diwali reception speech". Gov.UK. Government of the United Kingdom. अभिगमन तिथि 3 November 2013. ↑ PTI (10 November 2007). "Prince Charles, Camilla celebrate Diwali in UK". Times of India. अभिगमन तिथि 3 November 2013. ↑ "Their Royal Highnesses The Prince of Wales and The Duchess of Cornwall Celebrate Diwali at BAPS Shri Swaminarayan Mandir, London". www.mandir.org. BAPS Swaminarayan Sanstha. अभिगमन तिथि 3 November 2013. ↑ Thompson, Jessica Cargill. "Seven wonders of London: BAPS Shri Swaminarayan Hindu Mandir". Time Out London. Time Out Group. अभिगमन तिथि 3 November 2013. ↑ Jones, Toni (4 November 2013). "Samantha Cameron glitters in a spectacular autumnal sari as she celebrates Diwali on visit to Hindu temple". Daily Mail. अभिगमन तिथि 4 November 2013. ↑ PTI (17 October 2009). "Brown celebrates Diwali at 10, Downing Street, in a 'historic' first". Times of India. अभिगमन तिथि 3 November 2013. 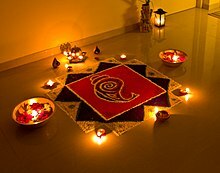 ↑ "Diwali – The Festival of Light". Leicester City Council. ↑ Johnson, Henry; Figgins, Guil (2005). "Diwali Downunder: Transforming and Performing Indian Tradition in Aotearoa/New Zealand". New Zealand Journal of Media Studies. 9 (1): 25–35. आइ॰एस॰एस॰एन॰ 1173-0811. ↑ Kadowala, Dilip (1998). Diwali. London: Evans Brothers Limited. आई॰ऍस॰बी॰ऍन॰ 0-237-51801-5. ↑ Mohan D, Varghese M (1990). "Fireworks cast a shadow on India's festival of lights". World Health Forum. 11 (3): 323–6. PMID 2291800. ↑ Ahuja RB, Bhattacharya S (August 2004). "Burns in the developing world and burn disasters". BMJ. 329 (7463): 447–9. PMC 514214. PMID 15321905. डीओआइ:10.1136/bmj.329.7463.447. ↑ Jha, J. C. (1976). "द हिन्दू Festival of Divali in the Caribbean". Caribbean Quarterly. 22 (1): 53–61. JSTOR 40653317. ↑ Shashanka, Swami (2012). "Role of Spiritual Science in Leadership and Management". Purushartha. 5 (2): 93–106. ↑ Derrett, J. Duncan M. (2009). "An Indian metaphor in St John's Gospel". Journal of the Royal Asiatic Society. 9 (2): 271–86. JSTOR 25183679. डीओआइ:10.1017/S1356186300011056.